The weather is pretty cold in Ohio during these winter months, but there’s lovely warmth glowing from inside the Diersing home. Just look. It’s in the paint colors, scattered around randomly among the collections, and boldly hanging on the walls. This is a family who makes things and makes them beautifully, but I think what they’re making most of all are memories. Beautifully. Enjoy the tour! A: This house is home to my husband, Brian, myself, our daughter, Livi, and two felines, Eli and Lucy. We live in Cincinnati, Ohio. My husband and I are both designers and were born and raised here. We interned in Boston during college, and then moved to Los Angeles after graduation. We lived there nine years, and then returned to our roots eight years ago to be closer to our families and start our own. Brian is co-founder of Openfield Creative, an interactive and digital marketing company, and I am co-founder of Egg2Cake, a paper goods company dedicated to celebrating and capturing not only life’s milestones but the in-between moments, too, from the mundane to the memorable. I also freelance for design agencies around the country as well as for my own clients, and I’m a weekly contributing blogger on Cincinnati Parent. Q: How would you describe your design aesthetic? Has it changed since you’ve added your daughter to the mix? A: We both have a very modern aesthetic, tempered with a rustic flair for antiques and found objects from the natural world. At this point, I’d say we’re pretty relaxed about our surroundings; parenting has a way of doing that to you! To no one’s surprise, there are objects that can be found in every room that speak to Livi’s presence, especially her creative pursuits. 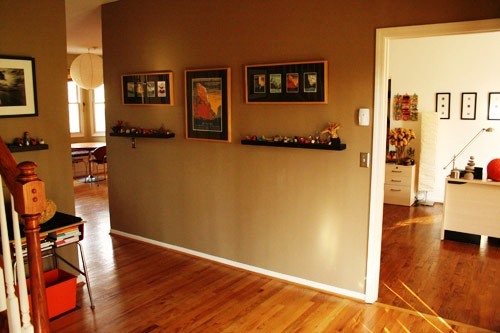 Q: What’s your favorite piece of art in your house, and the story behind it? A: We have a lot of art in the house! All of us enjoy making things in a variety of media, including drawing, crafts, clay, recycled creations, paper goods, needle felting, writing, photography, video, and woodworking. We also collect inspirational finds from travel, nature, and my favorite retail destination: the museum gift shop. And lastly, we have art created by friends who are artists, designers, photographers and crafters. Our favorite piece? That’s a tough one! 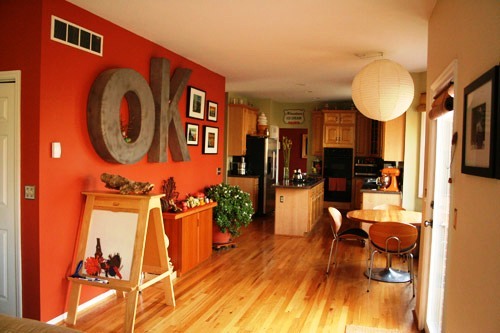 One of our favorites might be the OK letters hanging in our kitchen. My husband found a batch of the giant metal letters at the infamous Rose Bowl flea market in LA. They used to be a part of the Bullocks department store chain. We bought a K, L, and O, just because we liked the letter forms, and had the white paint removed by sandblasting. After moving back to Cincinnati, we secured the O and K to the wall and then, as fate would have it, our daughter was born nine months later and given the same initials by coincidence. Q: Tell us about your collections; what do those tiny glass bottles in your office hold? A: I’m a compulsive collector of found objects in nature. I joke with family and friends that I’m cheap and easy to buy for; just grab some dirt from your next trip! I have a collection of sand bottles — 93 currently! — from around the world that I started over 15 years ago on my first visit to Death Valley. On that trip alone, I collected four different colors and textures in sand and dirt. Even green and purple. 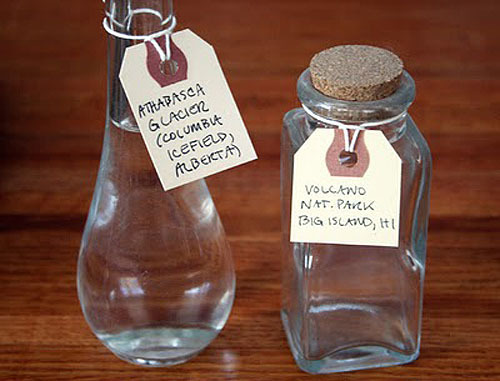 Two samples that always raise eyebrows: the bottle of water from the Athabasca Glacier in Alberta, Canada, and the empty bottle from the Volcanoes National Park in Hawaii. I don’t consider myself to be superstitious, but after reading some letters from visitors that took lava rock home and the awful luck that found them, I decided to demonstrate some unusual restraint in lining my pockets. My husband secretly lives in fear that we’ll be arrested going through airport security with my finds, and my father says that there’s no predicting the explosion that will occur at my home if the bottles fall from the wall and the worldly contents mix. 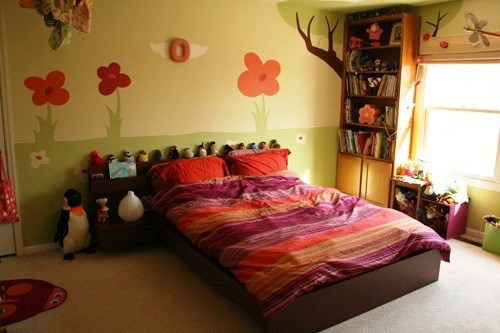 Q: How much influence did your daughter have on the design of her room? What’s her favorite part? A: Though my daughter is seven now, my husband and I are grateful in that we haven’t had to tackle repainting Livi’s room yet. 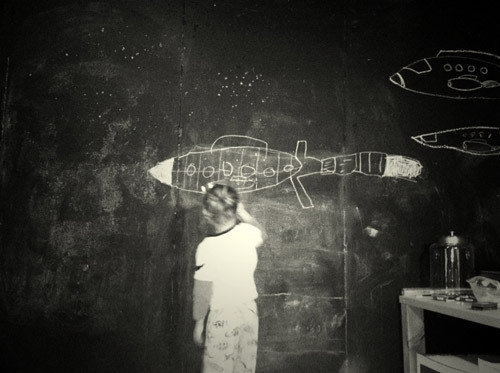 The walls were first drawn and painted by Brian and me before Livi was born. We knew we were having a girl but luckily we didn’t make it too girly, since she’s a tomboy through and through! Her favorite part right now is no doubt her big girl bed, which we bought last month. It happened to coincide with her new-found obsession for reading chapter books, so the first morning she stayed in bed reading for hours. 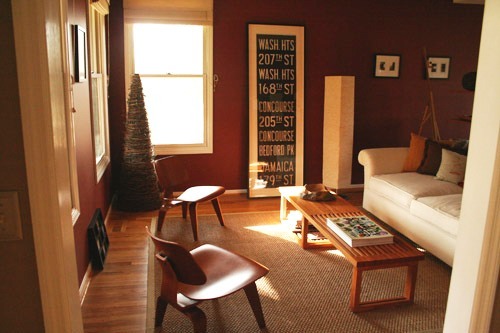 Q: How does your home reflect your personal style? 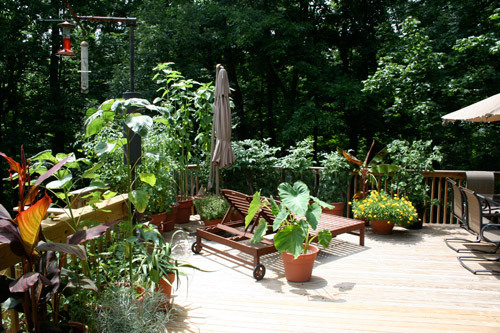 A: Our home represents life in its finest moments, outside of traveling which requires leaving our home! It’s a hub for creativity, growth, inspiration, celebrations with family and friends, and daily opportunities for observing wildlife and Mother Nature in all her glory, 365 days a year. I probably feel the strongest connection to our home, because I’m here the most since I’ve been able to work from home for the last eight years. The kitchen table is a favorite place, since it has hosted many years of family crafts and meals. The dining room makes me think of family gatherings and holidays. My husband would probably pick the basement shop, where he makes things with Livi. I also love my office, which is jam-packed with all sorts of inspiration and where I can be focused on work while hearing home life right outside my door. I love to walk our three wooded acres and savor the changing seasons and wildlife which includes deer, wild turkeys, owls, birds, and the occasional horse from a neighbor’s farm. Work and home have blended beautifully over the years, from living and working in the same space to creating Momglish, an Egg2Cake product line inspired by motherhood. Q: Your daughter is a little older now, but what’s your philosophy on keeping collections out and within reach with young children around? A: We’ve never been the type to have expensive objects lying about, but I think there’s a certain amount of respect for cherished keepsakes or creations that comes from a child watching an adult engaged with something they’re passionate about, and also when the adult shares the experience with the child. You can verbalize rules but the most powerful lessons are learned by watching actions. For being just a kid, Livi seems to have a strong sense of presentation, which no doubt comes from living with two designers! Last year, she went through a stage of having an art store which can be attributed to my paper goods shop. And she loves planning parties, decorating for the holidays, making her own centerpieces, and documenting things, all of which I’m blissfully guilty of. 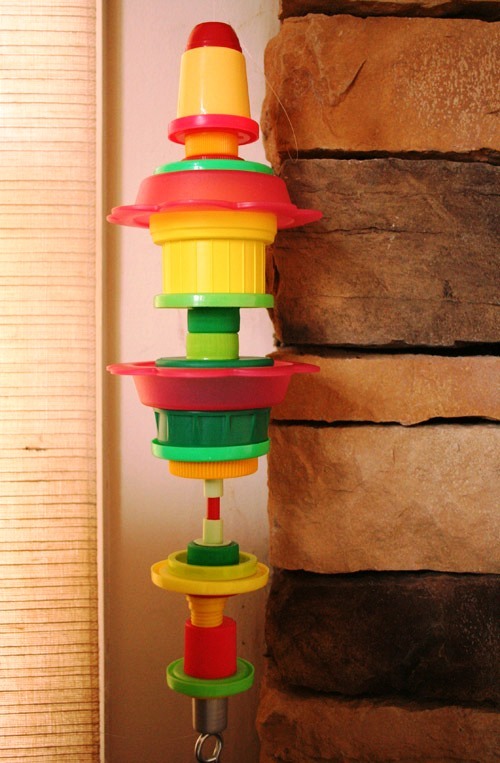 A: I really enjoy seeing all the things my husband and daughter make from plastic bottles, containers, caps, etc. Not only is it less for the landfill, but I think it’s a great exercise in maximizing imagination and problem-solving and making something out of nothing. We’re hopeful believers that a childhood chock full of these kinds of projects will have a positive impact on adulthood. 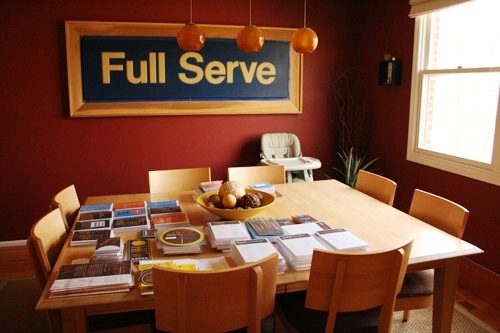 Q: What’s the biggest challenge in your home? A: Though our house definitely feels like home and reflects us, we wouldn’t say it’s our dream home since it’s not unique in architecture or of historical significance. We love the types of houses you see in Dwell magazine, so our hope would be to someday have the opportunity to live in one, surrounded by nature. We have a friend who lives in an old firehouse, so you can imagine the fun renovations going on there! And my husband would love a barn or warehouse to really kick-start his love for collecting old signage. A: My husband and I both believe that creative problem-solving is an important part of life, and we’ve been fortunate enough to have that in both our personal and professional lives. What we hope to teach our daughter is that a child’s sense of wonder, curiosity, and playful experimentation are all important traits that can serve her well in leading a creatively fulfilled and adventurous life, no matter her occupation or circumstance. And if she’s fortunate enough to marry her passions with her life’s work, life won’t feel like work at all! 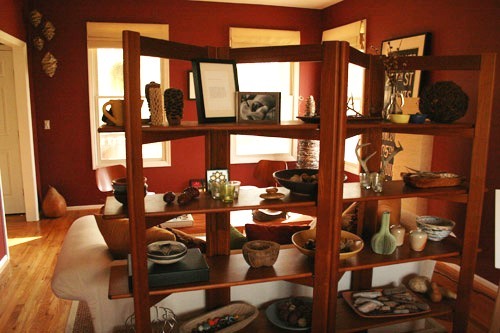 Jamie, your home does reflect you: artistic, thoughtful, and warm! Thank you for sharing it with us. 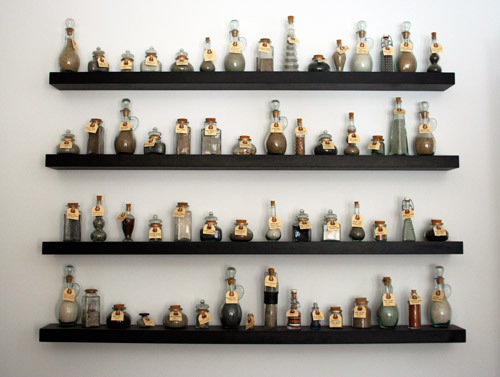 Friends, doesn’t Jamie’s sand bottle collection give you ideas? Memories turn into original art and aren’t hidden away in scrapbooks on a shelf, so you can see them and be inspired by them on a daily basis. I like that idea very much, don’t you? P.S. — If you’d like to share your home with us in my Living With Kids series, drop me a note. I’d love to hear from you! what a beautiful space. a touch of pottery barn meets modern. How fun to see a house from my home town in Ohio. I love their house! This is beautiful. I loved every bit of it–especially the hanging kid’s art. Thanks for sharing this. 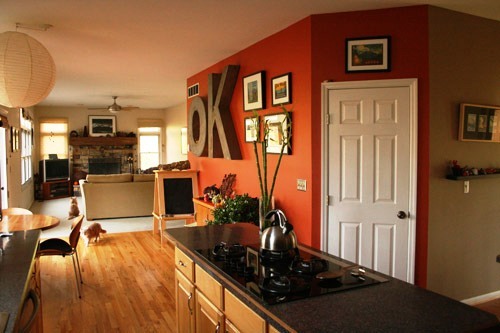 I love that orange wall. It reminds me of my old place. People thought I was crazy when I bought the orange paint, but I loved the way it looked! Ahhh…I love seeing into the lives of other creative families, and especially when they’re in my own Midwest city! Beautiful home filled with lovely treasures. Love this home. The sand collection is so cool. 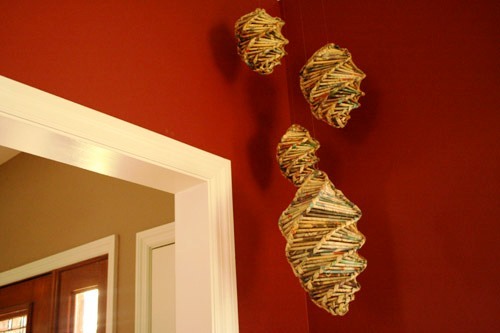 And I absolutely love the mobile of artwork hanging from the ceiling. I may have to do that with some of my daughter’s art. I love the OK letters! You have a wonderful home! The thing that made me catch my breath was your fabric holder. I’m assuming it’s a few letter sorters, but where did you get them? I’m hoping to redo my sewing space and I would love something similar to display the pieces I love. Those are indeed letter sorters, purchased many years ago at perhaps Pottery Barn or something like that. Would be fun to find some cool antique ones too! Inspiration for this actually goes to a friend of mine who loves to sew and had an antique bed headboard turned sideways in her studio with large swaths of fabric woven in and out of the bars… I’ll never forget it! If you find one like it, would you let me know. I would like to buy one too! :) Love that idea! Thanks! I’m curious what kind of racks did you use for the fabrics? What is the fabric holder made of? I am looking for the letter organizer you used for your fabric. Do you think I could still find them? Where can I purchase the wire fabric rack? Love it. I love your pix of fat quarter arranged so nicely. Did you make it or where can I buy one? The search for these letter sorters is killing me. If I don’t find 10 of them pronto, my fabric stash will be very sad. I’ve been constantly searching for 4 months now. I might have to resort to rigging one up. Is it possible? Maybe if Jamie takes a picture of one without the fabric, we can see what it really looks like. Jamie? Thanks for letting me include Jamie’s awesomely organized letter sorters in my fabric organization round-up. Here’s the link to the post in case you want to stop by and check it out! Love the storage for your craft material!! Where did you find the letter sorters? I want to know where you found your plate organizer that is holding all the fabric. I have looked all over the internet and can’t find it. Please share!!!! 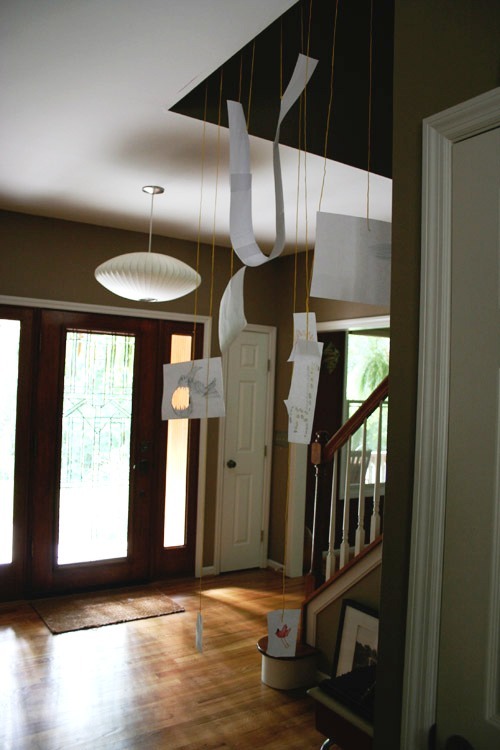 Sometimes you can find unique wall-mounted paper and letter sorters at Target, Meijer, scrapbook stores, and office supply stores as well. 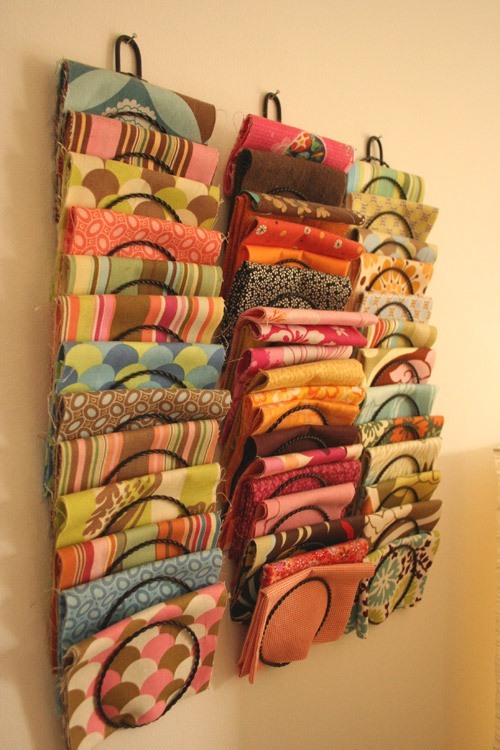 I want to know where to get the plate rack that is storing fabrics hanging on the wall . It is so cool! The sand collection is so cool. 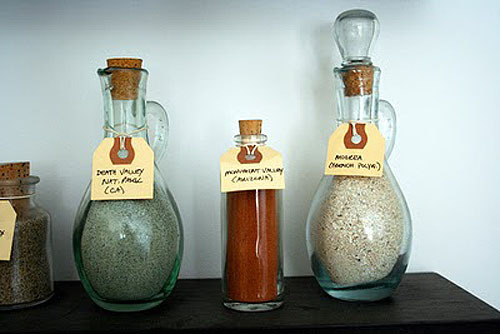 I Love the mini storage vials for your sand collection craft. I have search for these for these assortment of mini glass containers for no avail. I would like to know where did you get the mini storage vials for your sand collection craft hanging on the wall? Hi! 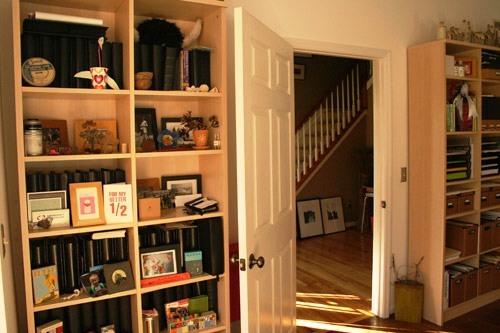 I love the way the fabrics are stored – and displayed – in letter holders on the wall. However, the thing that caught my eyes most, and what I was looking for, is the letter holder itself. Do you know where I can buy one? I am a terrible clutterbug, and since my husband passed ten months ago, it has taken a turn for the worse. I really need a place to stack my bills so that I don’t lose them – but it would be SO much nicer if the stack also was nice to look at! Me, too! I need to find that mail sorter! I have a perfect use for it. I’ve exhausted all of my Google search tips and techniques, so I’m hoping you’ll have a heart and share your source. Please? Pretty please? I’ll send pictures of the finished project! I too have collected sand from throughout my travels. I love the bottles that you have used, where did you find them? This may do for a fabric rack because of thicker item. Many say it does not work for cards as they are thin.